Sometimes you prefer things in your platter without having to try it out standing in the longer queue, we all like to be served in the restaurants and jokes apart, on professional front as well. Therefore we like to avail those opportunities that come to us directly. Nothing amazing ever comes for free but if it comes, one must not ignore it and there & then grab it like there is no tomorrow. For all those designers out there who have been seeking some ‘ready to use’ freebies and mockups, here on the blog you shall find what you have been looking up for. Subscribe us so you won’t miss any of our regular design assortments. Today it is about iMac pro and yes Apple has done wonders from the last couple of years, we have seen a drastic change and expansion of its selling/business. There is no house on planet earth as far as I know, that does not have its devices/iPhone/MacBook etc. Yes, this is one of those refined banners that’s expensive but has never compromised on its specialty, uniqueness, and charisma. What was the recent purchase of yours by Apple? Well mine was Apple iPhone 8 Plus, and it just blows me away every time I use it. Besides I have always been on my MacBook. Therefore my today’s post is also dedicated and reserved to it. 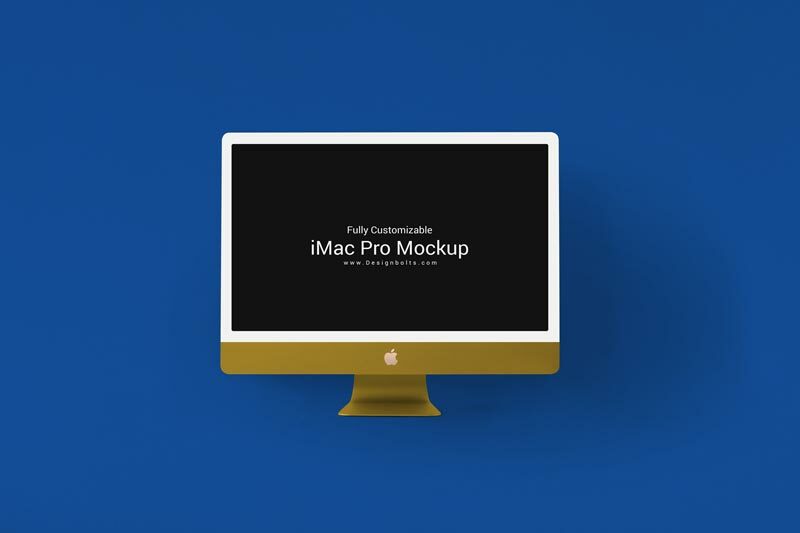 Check out this free fully customizable iMac Pro mockup that can be implied for both commercial and personal projects. You can place any typography poster, logo design, saying, quote into it or to show icons that you have drawn for your clients can be very well placed in it. Through this mockup a very fancy presentation can be made by you so add up your personal creative elements into it & yes, it is ready to be used. It will make your presentation meaningful, stunning and nevertheless impactful. Try it for yourself and remember we are here to benefit you as much as we can through our artistic shout outs and creative design collections. Here we go.